I’m a firm believer in giving meaning to vocabulary terms through context. This year I have yet to give my students a list of vocabulary words up front, have them define the words only to give a vocabulary quiz within the same week. In actuality, I haven’t given a vocabulary quiz at all, well a paper and pencil quiz. When it comes to vocabulary, I ensure my students have engaged in some sort of task or problems solving situation. Through the process of completing the task or problematic situation I inquire if anyone knows a term for a particular idea. For example, when working with integers on a modified rekenrek, discussed in my Elementary and Middle I Thee Wed post, students discovered a white bead could be aligned with a red bead. This prompted me to ask, “Does anyone know what it’s called when you have a positive aligned with a negative?” The conversation of zero pairs and neutral came to life. Vocabulary moments happen like that often. One of the best parts about it is, students record the term in their word wall, located in the back of their notebooks, with a definition developed by one of their peers. It is in language they understand and connected to an experience they’ve had. 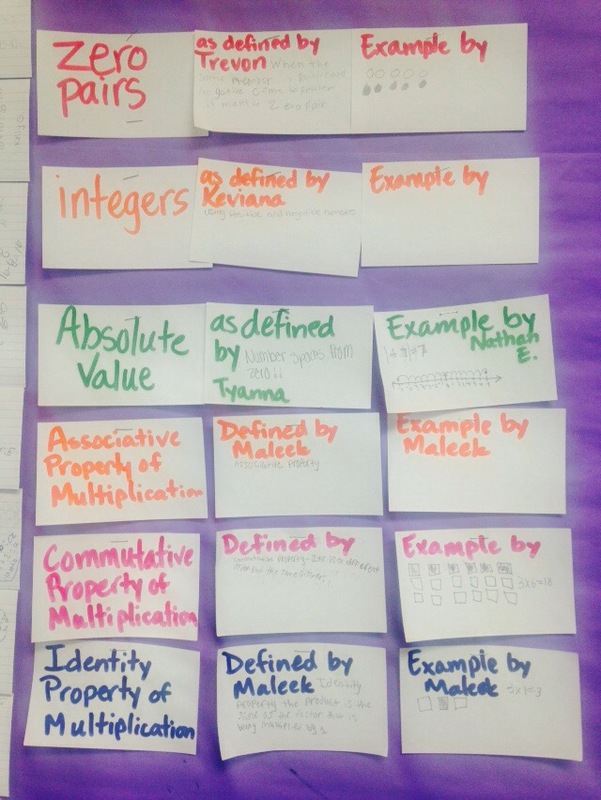 It also becomes a part of their math language as we continue to apply the idea of the terms. The definitions are reinforced this way. Our class word wall. All terms introduced this school year are defined by students with examples provided by students. Those written by me are terms defined based on students background knowledge. 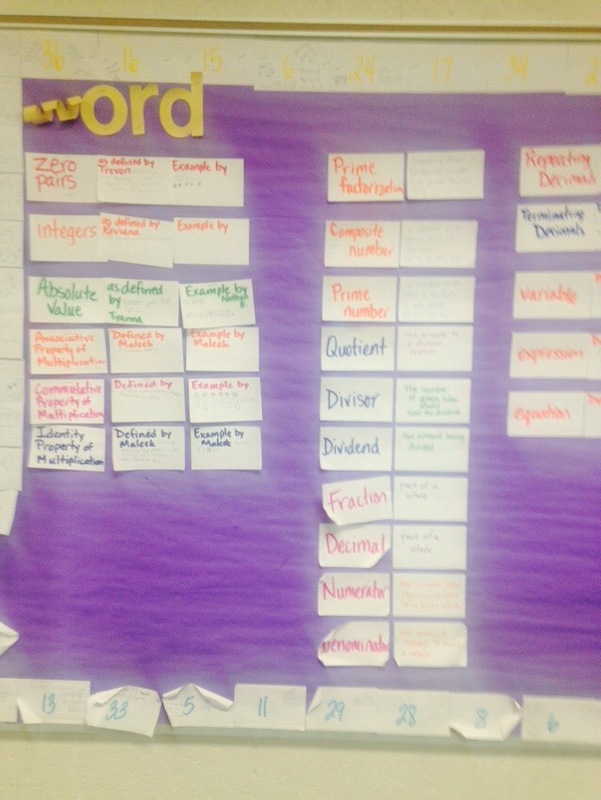 Record 4 vocabulary words on the board in a 4 quadrant manner. Call two students up to the board to stand on either side on the diagram. Provide an example or definition of one of the terms. Students try to be the first one to smack the correct term. Using fly swatters adds a level of excitement to the game. For this game, students number a half sheet of paper from 1 to 4. 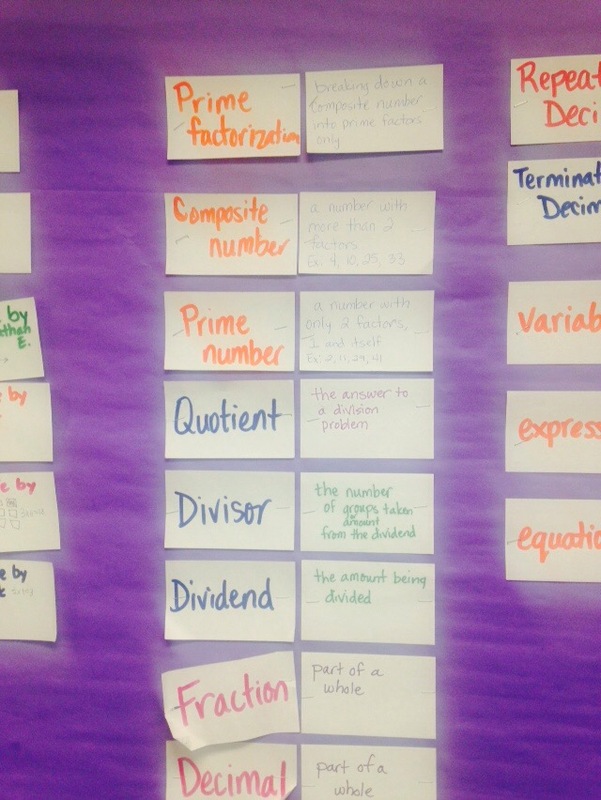 You secretly select a term from the word wall and give students 4 clues to determine the exact word you’ve chosen. The first clue is always, “It’s on the word wall.” With each clue, you want to get a little more specific to the characteristics or definition of the selected term. Clue 1: It’s on the word wall. Clue 2: It’s part of a whole. Clue 3: It can be determined when converting a rational number to a decimal. Clue 4: It never stops repeating. I love your thoughtful vocabulary development here. My favorite bit is that the words are “connected to an experience they’ve had.” So important. Thanks for sharing your word wall! Thanks for the feedback Chistopher. I found success with that practice in elementary school. Bringing that idea into middle school has brought the same success so far. 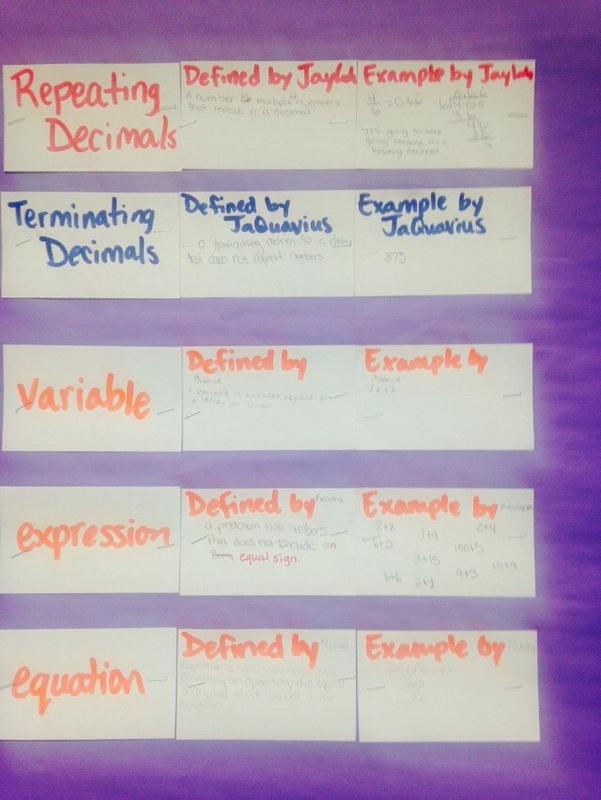 And I’m measuring success with the students’ ability to apply the concept of the vocabulary term. Because what’s the point of knowing a word if you can’t use it properly right? I plan to use the vocabulary swat activity. I think it will engage them well! Thanks!